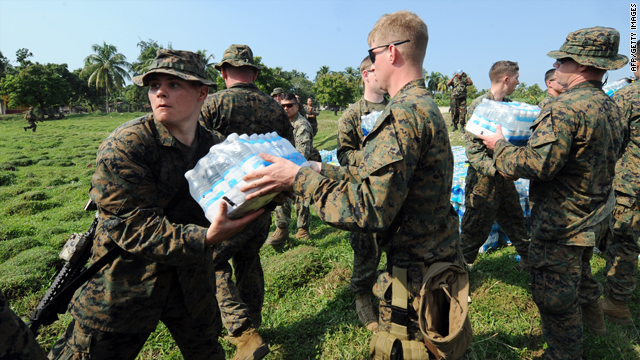 U.S. Marines load a U.N. truck with water to be distributed among Haitian earthquake survivors in Leogane on Wednesday. (CNN) -- As Haiti struggles to cope with the aftermath of last week's devastating earthquake, there was a call Wednesday for a modern-day Marshall Plan to build a new nation out of the country's ruins. In an interview featured on CNN's "Amanpour," the head of the International Monetary Fund (IMF), Dominique Strauss-Kahn, said, "My belief is that Haiti, which has been incredibly hit by different things -- the food and the food prices crisis, then the hurricane, then the earthquake -- needs something which is big, not only a piecemeal approach, but something which will be much bigger to deal with the reconstruction of the country, some kind of a Marshall Plan." The Marshall Plan was the huge U.S. effort after World War II to rebuild the shattered economies of Western Europe. It was launched by then-Secretary of State George Marshall with the goal of bolstering American allies in Europe as they faced a rising Soviet military threat. Strauss-Kahn did not offer specifics of what he envisions for a Haiti rebuilding effort, nor did he outline a time frame. "The urgency, today, is to save the people. The urgency, in some weeks, will be the reconstruction," he said. "The most important thing is that the IMF is now working with all donors to try to delete all the Haitian debt, including our new loan. If we succeed -- and I'm sure we will succeed -- even this loan will turn out to be finally a grant, because all the debt will have been deleted. And that's the very important thing for Haiti now," Strauss-Kahn said in the statement. He said the IMF put the funds into a loan rather than an outright grant to act quickly, with the IMF not having a way to make such a grant immediately. "And so, the question was: were we going to do nothing or give a loan? We decided to give a loan -- but a zero-interest loan, with a long grace period," he said. Also Wednesday, U.S. Assistant Secretary of State for Western Hemisphere Affairs, Arturo Valenzuela, told CNN's Christiane Amanpour that the U.S. is committed to Haiti now and for the future. "This will be one of the largest assistance efforts, I think, in current history." The U.S. has deployed, or is sending, 20 Navy and Military Sealift Command ships to Haiti, including an aircraft carrier and amphibious ships that carry landing craft and helicopters, as well as thousands of sailors, soldiers, marines, airmen, and coast guardsmen. Valenzuela insisted the huge scale of the military effort does not indicate that the U.S. has any intention of "occupying" Haiti, as one French official suggested. On Monday, French Cooperation Minister Alain Joyandet said, "This is about helping Haiti, not occupying Haiti." Valenzuela said, "I want to make very, very clear that the position of the United States on this is that our military forces are there simply to work with the immediate humanitarian crisis, to bring in the food, the medicine, to help with the rescue." He added, "The security issues in Haiti are in the hands of the forces from the United Nations. We're there to support them and there's a very good cooperative agreement with the United Nations forces there." 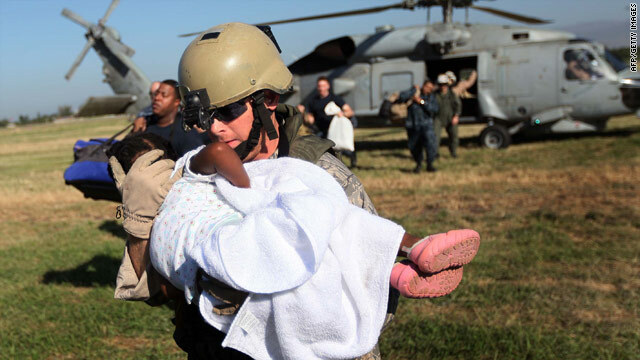 Valenzuela said that after the search-and-rescue operation has been completed, the Obama administration wants to bring Haiti to a position where development can actually take place. "There's already a strategic plan in place that looks at all sorts of areas, such as energy agriculture, jobs, employment, and strengthening some of the institutions in Haiti." But he emphasized it's a truly international commitment. ""We're working with other partners in the world in order to try to address the short-term issues in Haiti, as well as this long-term effort to reconstruct the society," Valenzuela said.